A Star Is Born (aka the movie where Lady Gaga shows she can actually act) lives up to its promise. A star was born. 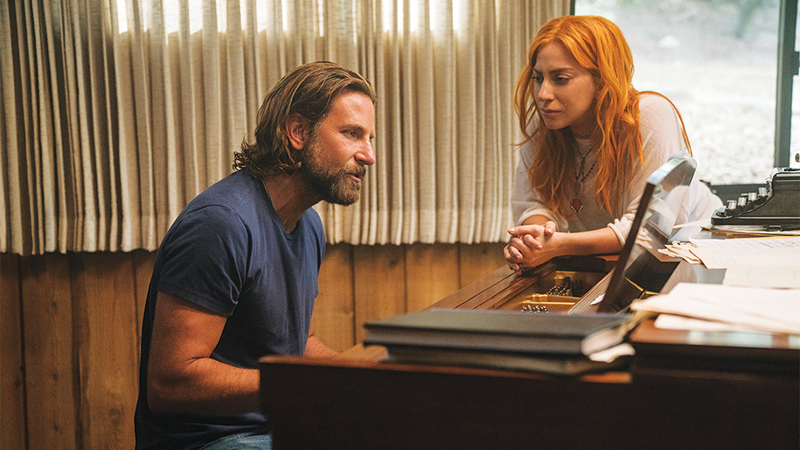 Though Gaga’s Ally, an unknown singer-songwriter, does step out of the shadows and come into her own, it’s first-time director Bradley Cooper who’s reborn and raised to new heights. Grand-slamming a directorial debut is a feat on its own, but the actor-turned-director also turned-musician, mastering the guitar and piano, and working to modify his voice to a raspy, Southern, low-octave drawl. His musicianship wasn’t just faked to get by; Cooper put in work to achieve pro-level status. (After all, when you’re sharing the stage with one of the world’s greatest pop stars, you’ve got to up your game.) Jackson Maine’s cowboy headgear certainly wasn’t the only hat he donned. Being the fourth version of its kind, the story remains mostly the same. Superstar male celebrity meets unknown rising star, and the two fall in love while he helps her achieve super-stardom. Gaga’s Ally works a job she hates while moonlighting as a late night singer in a drag bar. Jackson stumbles in looking for another drink to fuel his raging alcoholism just in time to witness Ally’s wowing rendition of “La Vie En Rose.” The two meet after her show and wind up talking, drinking and getting into bar brawls. Their connection is electric; Ally writes a partial track on the spot standing in a convenience store parking lot nursing her bruised hand. Jackson then flies her out to his next gig and entices her on stage to live out her dream, thus, kick-starting her pop career. And so it begins. Cooper and Gaga eschewed the typical method of pre-recording the tracks and lip-synching on set. Instead, they went for broke, performing all the movie’s songs live as they filmed. Thanks to this tenacity, the film’s authenticity hits hard. Every single sound of every single live performance—from Maine’s shredding country-rock toe-tappers to Ally’s showstopping numbers on the piano—was captured on set by sound mixer Steve Morrow. According to Variety, Morrow used two 32-channel mixing boards and recorded more than 60 unique tracks at a time. Even if romantic dramas and musicals aren’t your bag, the production is undeniably impressive, unheard of, even. Technical proficiency aside, A Star Is Born colossal and bright, like the last sweeping blockbuster eking its way out of summer. It dares to blare all the way to the rafters and flash its showy concert-quality performances recorded in sleazy dive bars and endless festival grounds. While its energy and pizzazz are certainly rousing, it’s the quieter, sadder moments that are most deafening. The characters create art and fall in love, but as Maine’s alcoholism worsens, his lust for what he does fades. Ally’s star shines brighter, yet his conversely dims. How the film handles his issues, including a rugged past he can’t quite escape, adds to its verisimilitude. Cooper allows scenes to breathe, avoiding tropes and focusing on love despite whatever ailments plague the characters. Even during one particularly brutal fight where the two sling ugly insults at each other, there’s a raw tenderness bubbling under the surface makes the story of Ally and Jackson both real and tragic, one for the ages. Supporting the two leads is Andrew Dice Clay as Lorenzo, Ally’s father, and Sam Elliot as Bobby Maine, Jackson’s older brother and manager. Dave Chappelle pops in as Jackson’s friend and retired musician Noodles. All included, there’s not a single weak link in the bunch. Clay and Chappelle are charming in their own ways, but Elliot wields true supporting player prowess. Bobby lived through everything that weighs Jackson down, including a drunken father. We watch the two men continuously work through their own interpersonal issues from boyhood and beyond, all inside the pressure cooker that is stardom. The movie strips away the luxurious veneer of celebrity, diving into the stars’ humanity and showing that it’s the same as our own; no one is immune from life’s undulant beat-downs. Bobby’s love for his brother and his hurt from Jackson’s downward spiraling come to a head in the very capable hands of Elliot. It’s an Oscar-worthy performance that adds yet another layer to the movie’s melange of emotions.